ORLANDO — Pitching, pitching and more pitching. That was the story for USF softball (32-15, 10-2) this weekend as the Bulls swept War on I-4 rival UCF (28-14, 7-5) at the UCF Softball Complex in Orlando. Bulls pitching allowed only one run in 27 innings over the weekend, leading the way for USF to pick up its ninth straight conference win and third straight conference sweep. Sophomore Georgina Corrick pitched 19 scoreless innings, including all 13 innings in Friday’s 2-0 win and the first six in Sunday’s 3-0 win. Combined with her start against Florida on Wednesday, coach Ken Eriksen said Corrick had a pretty good week. Corrick’s performance Friday matched the USF record for innings pitched in a single game. 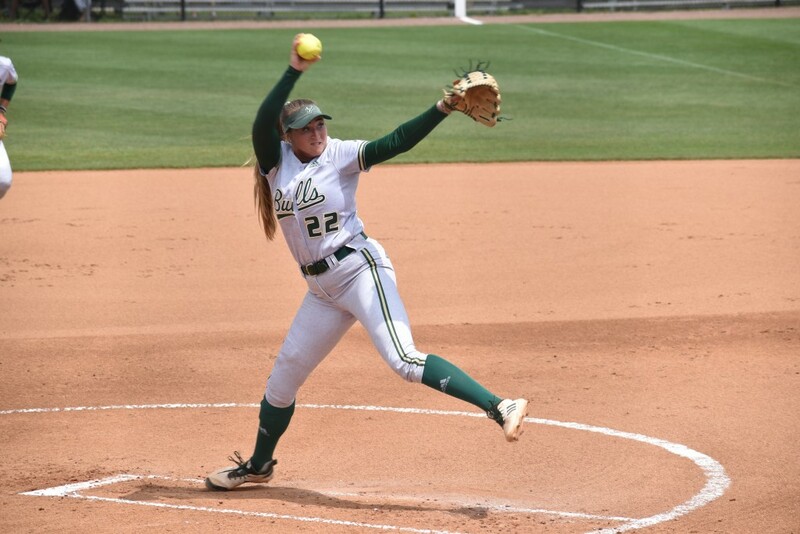 The only other Bulls to pitch as many innings in a single game are now in the USF Hall of Fame — Sara Nevins (2013 vs. DePaul) and Monica Triner (1999 vs. Maryland). Senior Nicole Doyle also shined in the circle Saturday, throwing 6.2 innings while allowing three hits in USF’s 3-1 win. Doyle also recorded two outs in the seventh inning Sunday in relief of Corrick. “Nicole’s amazing. I could wax poetic about Nicole,” Corrick said. “She’s such an unsung hero. She comes out there every single game for the second game … and she comes out there and she shuts people out. Pitching was the clear theme over the weekend but if not for some timely hitting by senior Lindsey Devitt, things may have gone differently. Devitt scored what proved to be the game-winning run Friday and Sunday. Scoreless in the 13th inning Friday, Devitt doubled with one out before scoring on a Bethaney Keen homer. Also scoreless in the fifth inning Sunday, Devitt led off with a homer. With the Bulls’ sweep of the Knights and Tulsa only taking two games against ECU over the weekend, USF now sits alone atop the AAC. With just nine games remaining before the AAC Tournament in Houston, the Bulls find themselves right where they ended last season. But USF isn’t just now hitting its stride, even with nine straight conference wins. The Bulls have always been in that stride, according to Corrick.